Have you run out of ideas for digital services your company could develop? 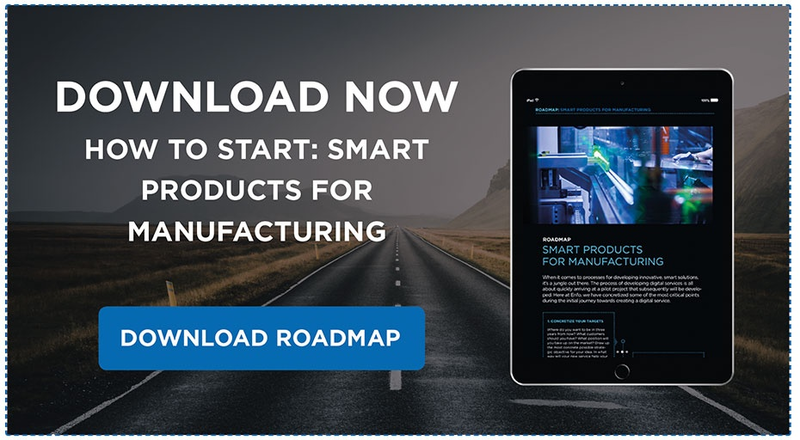 No worries... here are 12 examples of ways in which manufacturers have used IoT to make better, safer products. The total number of smart, connected products will soon reach 20 billion. It is calculated that by 2025 this figure will have risen to an unimaginable 80 billion. In other words, if you’re interested in doing better, smarter business, you have no choice but to take an interest in this uncharted ocean of opportunity. It is high time to consider exactly how you can improve your customer service, create new products and become more competitive. Curious? Read on – here are a few examples for you to ponder. 12 examples of how the Internet of Things (IoT) is currently used globally in manufacturing industries. Scottish startup Silent Herdsman has developed a special collar that farmers can use to monitor the health of their livestock. By fitting a collar containing a sensor that, among other things, is able to monitor the animal’s condition, milk production and imminent calving, the farmer is made aware of any potential problems at an early stage. Data is sent to a laptop, tablet or smart phone for analysis by the farmer. Now that’s smart! "By monitoring the health of animals, farmers can see problems at an early stage, improve fertility and increase farming efficiency." During the period May to October this year, Husqvarna will be testing a new concept that they call Husqvarna Battery Box. The solution is intended to make it possible for residents of western Sweden to share battery-operated gardening devices. This is one of several projects in which Husqvarna combine innovation and sustainability. Diaper brand Huggies uses technology to make it easier for parents to know when it’s time to change a diaper. A sensor located in a blue plastic button is attached to a child’s diaper. This sensor detects moisture in the diaper and sends a notification to Mom or Dad. An app allows parents to keep track of how many diapers they have left in stock. t-shirt. This makes it possible to track statistics on steps taken, heart rate, breathing depth, and energy expended. Electrical signals provide the app with data on which muscles are in use and the load to which you are exposing them. In this way, you can see your physical status in real time simply by checking your smartphone, avoiding overexertion and resulting injuries. Cool! In 2017, Caterpillar launched their new service, Cat Connect – making it possible for customers to follow a machine’s status in real time. Using this new service, managers at construction companies can follow their machine park with regard to issues such as performance, wear and tear and trends and patterns of use. This allows data-driven decision-making and optimal use of plant. Cat Connect drones also take high-definition aerial shots of building sites to provide advance knowledge of exactly what resources are needed and what settings need to be made. Ericsson Maritime ICT provides infrastructure for vessels, ports and terminals, with services tracking location and speed and monitoring temperatures for sensitive cargos – all displayed on a dashboard in real time. This data can be shared with other goods carriers so that the state of deliveries can be monitored from production until arrival at the final destination. Neat! Microsoft and Rolls-Royce collaborate to support Rolls-Royce’s intelligent engines and offer “advanced operational intelligence to airlines”. Rolls-Royce will be integrating Microsoft Azure IoT Suite and Cortana Intelligence Suite into its service solutions in order to collect data on flight operations, fuel consumption and maintenance planning. Rolls-Royce has already invested in jet-engine sensors to produce real-time data and report on engine status. Excellent collaboration! Virgin Atlantic has invested in IoT to connect a fleet of Boing 787s and their cargo equipment to IoT devices and sensors. Each connected aircraft can be expected to produce over half a terabyte of data per flight. Almost every component of the airplane has an internet connection, from engines to wing flaps and undercarriage. In this way, mechanical problems can be reported before they even occur. Safe! "Mechanical problems are reported before they even occur." The British insurance company Aviva has also chosen to develop its digital service in cooperation with a smaller startup instead of developing the technology themselves. Among other things, they have developed smart cameras to be given to customers to set up in their homes. All to make the customer feel even more secure with Aviva as their insurer. Talk about putting the user in focus! German vehicle manufacturer Daimler uses IoT to make their vehicles safer and more efficient. Daimler uses IoT to automate a number of safety procedures while the vehicle is on the road. For example, Daimler trucks are already equipped with proximity control, stop-and-go assistance, emergency breaking assistance, road-handling assistance and 3D maps. Everything to help trucks maintain a safe distance from other vehicles while on the road. They have also developed a stereo camera and radar sensor intended to improve driver response times. Innovative! British Gas have raised their IoT profile with the already established Hive, a smart meter that can control your heating and hot water remotely. Facilitating integration with smart energy use makes it possible for home owners to switch to Vacation Mode, basically a platform for connecting several devices. Customer focused! John Deere, renowned manufacture of agricultural, construction and forestry equipment, use large amounts of data and IoT to monitor soil moisture levels to assist farmers in watering to the correct level. Data that helps farmers to achieve better harvests, as they can now see when the soil is in optimal condition or if watering is required. And naturally, this leads to reduced operating costs and increased productivity. Productive! The term Internet of Things (IoT) covers everyday objects, such as household appliances, clothing and accessories, as well as machinery, vehicles and buildings, that have been equipped with inbuilt electronic components such as sensors, computer chips and internet connectivity. This allows the objects to be linked physically or wirelessly and then exchange data.